Q: Can you give us some background on who you are and what you do at MongoDB? Shannon: I am the Director of Education at MongoDB. I manage our education products, including online courses, in-person training curriculum, and certification. Sacha: I’ve been developing mobile apps with a passion since the age of 12 and now am an undergraduate student at Brown University majoring in computer science. This summer, I completed an internship at MongoDB, which was amazing! When the initial project evolved to offer another semester of work, I immediately jumped at the chance to be here and decided to take a semester off from school to be able to see the app grow from an initial idea into a full-featured product. Q: And how about some background on MongoDB University? Shannon: MongoDB University online began in October of 2012 when we opened the first two courses: M101: MongoDB for Developers and M102: MongoDB for DBAs. Three years and 300,000 students later, we have seven free online courses open to the public and three more under active development. Our courses are composed of a series of lessons organized into the major MongoDB subject areas. Each lesson comprises a short lesson video, followed by a quiz. There are also hands-on labs throughout the courses with well-developed solutions available to enable student measure their performance. These courses are one of the primary ways people learn about MongoDB and through which organizations develop MongoDB expertise. More than 400 of our customers and partners make use of the online education platform through a subscription offering to ramp their employees. 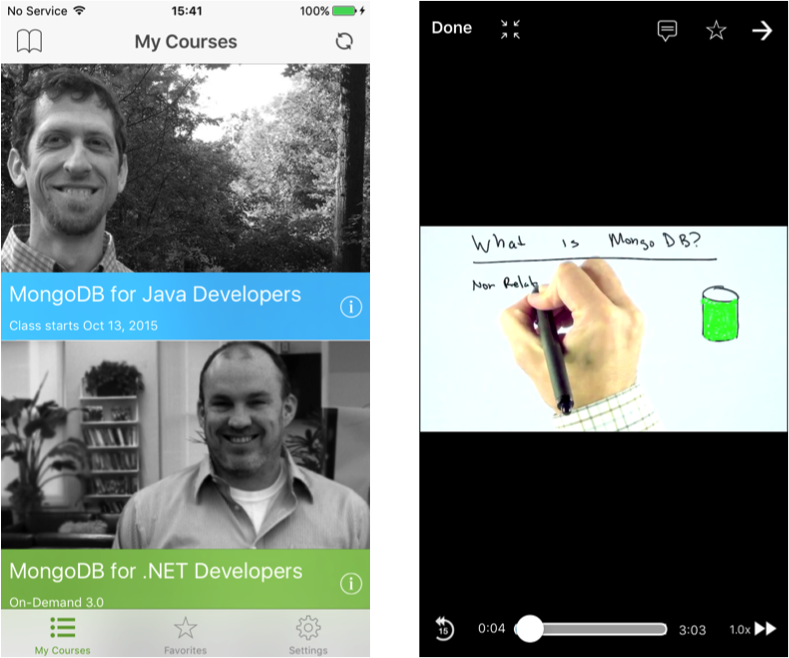 Q: When did you first start planning a mobile app for MongoDB University? Shannon: Plans have been in the works for about a year. Through a connection in another department, we found Sacha and hired him to develop our mobile apps. The iOS app is available in the Apple store. An Android app is on the way. Sacha: When I arrived here for my first day, Shannon asked me to spend a few days drafting redesigns for the mobile website as well as providing mockups for a mobile app. This is where I started my journey, which resulted in a month and a half of hard work. I can positively say I am extremely happy with the result given the short timeframe. Q: Was this something that MongoDB University students asked for often? Shannon: From the very beginning students have requested the ability to download videos for viewing on their commute and, in countries where bandwidth is spotty, to accommodate more seamless viewing (after downloading). Q: Was there a particular reason or goal for building the app now? Shannon: Yes – while our completion rates and overall engagement are quite high, we want to get them even higher. Typical completion rates for MOOCs are in the 5% range. Ours are 20%, but we think we can do much better. The larger goal is to enable greater engagement from our student community by making it easier to complete lessons and making the overall experience more enjoyable through a bit of gamification in ways that are compelling and enhance the overall learning experience. Q: Can you tell us more about what students can do with the mobile app? Shannon: Students can view the catalog of open courses and register for those of interest. They can download all lesson videos, complete quizzes, and favorite key material for later review. 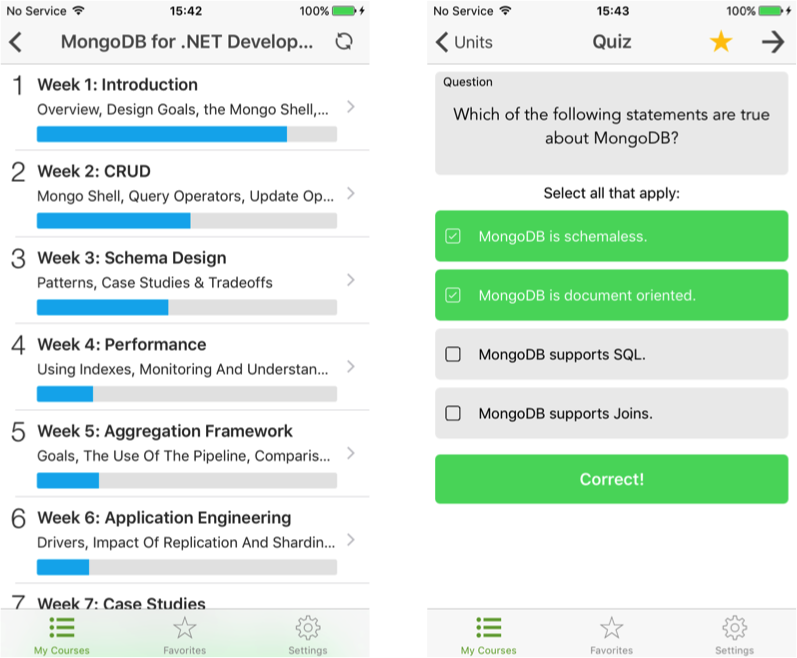 Our intention is that people will incorporate the app as part of their MongoDB certification exam preparations. Q: What challenges did you run into in the process of designing and building this? Sacha: The major challenge for me was making the user experience and design tailored to mobile while at the same time making the transition from website to mobile and vice versa as seamless as possible. This required a great deal of thought be put into the design and layout of the app as well as making synchronization with the website work smoothly. My goal was to make the app work side-by-side with the website allowing students to start on their computer, continue on their phone, and finish on their iPad without even thinking about syncing. Q: How do you envision students using the app in conjunction with the browser version? Sacha: We take our phones everywhere we go. There are many occasions throughout the day when we have small amounts of time in which we can watch a few lectures and learn a little more about MongoDB. The app will allow students to complete course material during these times – times when opening a computer, connecting to the internet, and waiting for the website to load in order to complete 10 minutes of course material isn’t an option. Shannon: Tens of thousands of our students spend several hours per week on trains and buses commuting to work. That’s more than enough time to view all the lessons for one week’s worth of a MongoDB course. Some people just prefer to view on their tablet even if using a computer would be easy. We designed the app to enable seamless transitions among phone, tablet, and computer and are already seeing people use it that way (almost without noticing). Q: What’s next for the app, or for MongoDB University? Shannon: Android! We’ll be rolling out an Android version of the app by the end of the year. Also, as I mentioned earlier in the interview, look for some new course announcements in the next couple of weeks. Thanks to Shannon and Sacha! If you’re already registered at MongoDB University, you can download the MongoDB University app in the App Store. Or register now at MongoDB University!